Last week I had mentioned about some heavy afflictions going on..Let us discuss them here and their likely impact. Chart on the left is of January 16, and it shows, Pluto square Rahu and Ketu.Saturn, uncomfortable in Scorpio, squaring uncomfortable Mars in Aquarius. What did we have in the last week?Surprising events. RBI reducing rates and Swiss Franc going off the peg in which it was placed, against the Euro.Both are trend changers with far reaching effects.Off the markets, terrorism hysteria is at a new peak. Entire Europe is in a ferment. Terror alerts of the highest order have been announced by European Nations.More than 5000 trained terrorists with a European face seem to have quietly slipped into various parts of Europe.Volatility has been on the increase in several markets. Intermarket divergences are also observed. Chart in the middle is of January 19, 2015.It shows the tight square formation of the Nodes continuing and Moon approaching Pluto. Moon is often times a catalyst.Venus and Mercury have begun separating, which is an indication of distribution taking place. Venus begins its opposition with Jupiter.And January 20 is a New Moon day.Chief luminary Sun hates being in Saturn`s house.Mars is about to conjunct Neptune. Mars is fiery energy forward and Neptune is all fog and liquid, without any shape, full of vagueness.Martian energy is seen to become dissipated.Additionally Mars moves into Rahu star, who herself is all feminine and liquid being in Moon star. 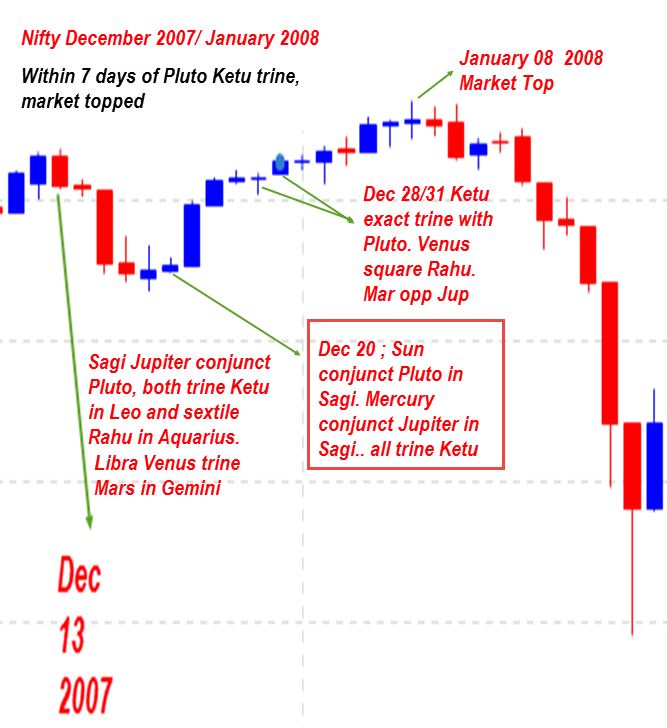 From hereon the Ascendant also is Aquarius and not Capricorn.Aquarius happens to be the eighth house of Nifty futures chart. 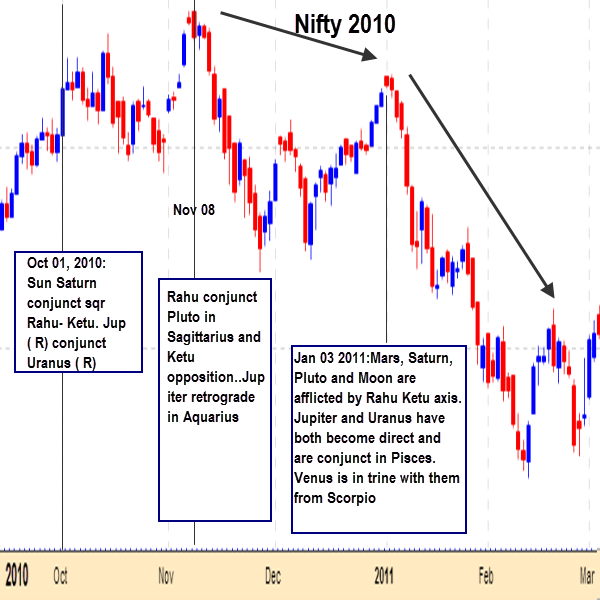 How do Rahu and Ketu affect markets, when they are in aspects? We find that in all major turning points, Rahu and Ketu were involved in aspects. Mostly when trines were there, we had long term falls. Squares tend to produce a bottom after a fall. The effect of Saturn square Mars and Venus opposite Jupiter also is the same. To top it, we have three Lunar phenomena this week, including a New Moon. So astro suggests that there is a scope for a fall and bottom formation. The question is whether Jan 23 is the low or will there be further downsides because of Ketu Uranus conjunction, opposed by Rahu? Last week on Thursday, January 15th, on Makara Sankranti, Raghuram Rajan gave a pleasant surprise to the markets with an unexpected rate cut. Was it destined in the charts? On 15th January 2015, Moon was in Visakha, in Jupiter star.So Jupiter effects were to be felt for the day. Since Jupiter was retrograde, opposite effects also could occur, depending on other aspects.What sort of effects could Jupiter give? It has to be a combination of Jupiterean and Mercury effects because Jupiter was in Mercury star. But then there were others also in Mercury star...namely Ketu and Uranus. Both Ketu and Uranus are known for sudden effect. Uranus is known for shocking and surprising effect. So we had a banking effect ( Jupiter) communicated ( Mercury) in a surprising manner ( Uranus and Ketu).That Moon was in aspect with Mercury manifested the event. To summarize, planets are indicating that markets world over will continue to roil for some more time. More fluctuations and surprises are in store in currency markets. And stocks could react lower despite the bullish momentum seen. It is also possible that the markets could go lower than on January 23, 2015. 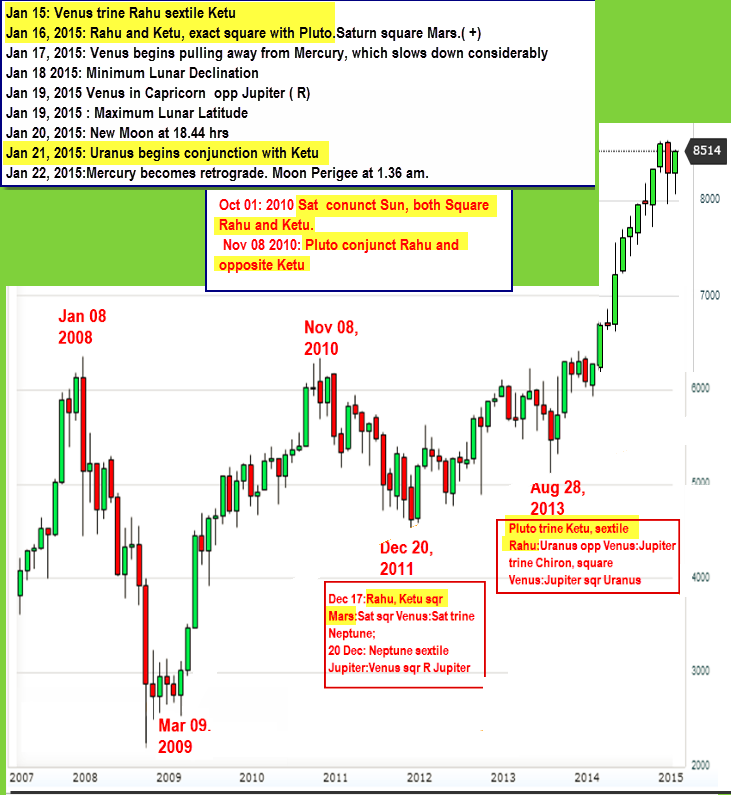 But since Mercury is retro, maybe we could also see a bounce after January 27, 2015. Having said all this, please note that Iam only student and these observations are meant for educative purposes. Please have adequate stop losses and risk management in place for all your trades. Hi Suresh, I too am looking at the reasons for the Jan 15th surprise rate cut by RBI, and the surprise move by the swiss bank to allow a free float of it's currency. 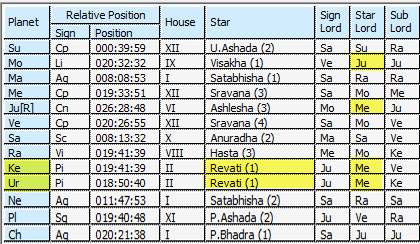 If you look at India's natal chart, Natal Jup is in Viskha at Sc-19 degrees. That is a transit hit during trading hours. In addition there is a Moon Rasi aspect to Ketu, all within about 3 degrees during trading hours. And Moons aspect to ketu is important as Ketu is the Nakshatra dispositor of Jupiter as well. So the effect is exaggerated.